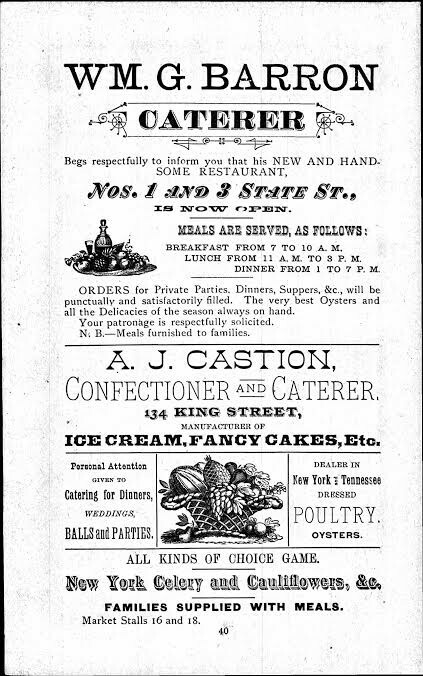 David S. Shields, drawing upon his research for The Culinarians: Lives and Careers from the First Age of American Fine Dining (forthcoming; Fall 2017), and in honor of Black History Month, put together this list of every black restauranteur in the city of Charleston, South Carolina, from 1880 to 1920 (first printed in the Charleston City Paper, and now run in full below). Agnes, G. W. 89 St. Phillip 1908 Allen, F. A. 81 East Bay 1881 Allen, Paul 530 King Street 1896 Allen, W. I. 41 Market Street 1882 Alston, George 19 Queen Street 1917 Atkinson, L. J. 104 Columbus St. 1910 Baker, Anna 161 Market Street 1920 Baker, Stephen 161 Market Street 1919 Barron, J. F. 401 King Street 1911, 1912 Barron, Rebecca 3 State Street 1901 Barron, William G. 12 State Street 1883, 1884, 1886, 1887, 1888, 1889, 1890, 1891, 1892, 1893, 1894, 1895, 1896, 1897 3 State Street 1898, 1900 (dies) Baskin, Joseph 623 King Street 1919 Beckett, Ann E. 92 King Street 1886 Blake, Eliza 11 Tradd Street 1886 Bold, J. 161 Market Street 1883 Bonneau, S. 51 Lines Street 1910, 1911, Bonneau House 1914 Bowen, F. 524 King Street 1883 Brockington, Adele E. 16 Market 1915, 1916 . . .
Congrats to sociologist Michèle Lamont, winner of the 2017 Erasmus Prize, which honors an individual or group who has made “an exceptional contribution to the humanities or the arts, in Europe and beyond.” The Erasmus Foundation cited Lamont—a professor of sociology and African/African-American Studies, the Robert I. Goldman Professor of European Studies, and director of the Weatherhead Center at Harvard University—for her “devoted contribution to social science research into the relationship between knowledge, power and diversity.” Books written, edited, or coedited by Lamont and published by the University of Chicago Press include the collection Cultivating Differences: Symbolic Boundaries and the Making of Inequality (coedited with Marcel Fournier); The Cultural Territories of Race: Black and White Boundaries (edited by Lamont); and Money, Morals, and Manners: The Culture of the French and American Upper-Middle Class. To read more about Lamont’s work, click here. . . .
Gems and Jewels is an app and the product of a unique collaboration between the University of Chicago Press and the Grainger Hall of Gems at Chicago’s Field Museum of Natural History (along with the Field Museum’s senior vice-president and curator of gems and gemstones, Lance Grande), published by the digital mavens at Touch Press. Crystals, crystals, crystals—also Etruscan gold necklaces, insects paralyzed in Baltic amber, and a 16th-century Aztec opal made in the image of the Sun God—all in 360-degree rotation, along with detailed captions and scientific data from Wolfram|Alpha, including classification, group, hardness scale, and chemical compound. Accompanying text unfolds from the upper left corner of each page and explores the roles of particular gems in human culture, explains geographic origins, and recounts the extraordinary histories of particular jeweled pieces. Starting today and for the next week, all Touch Press apps are 50 percent off at the iTunes store, including Gems and Jewels. You can check out the sale here. 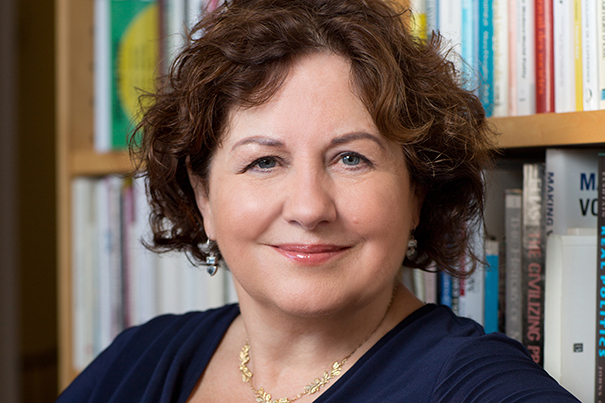 If you’ve never had a look at the app before, the video below should give you an indication of what you’re missing: To read more about Gems and Jewels, click here. . . .
Yuliya Komska: Can civilians make borders better? 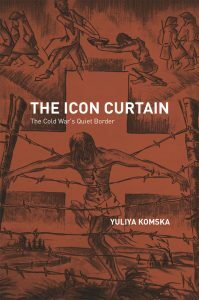 “Can civilians make borders better?” by Yuliya Komska, author of The Icon Curtain: The Cold War’s Quiet Border (2015) *** Received wisdom contends that borders and walls are the work of states and supra-national bodies eager to regulate security, the movement of populations, and the flow of commodities. Not surprisingly, the construction and enforcement of these zones rely on weaponized technologies, substantial armed presence, and the use of surplus materials. Whether skimming the European Union’s southeastern edge, snaking between Israel and the West Bank, or cementing the line between the United States and Mexico, borders coalesce as militarized spaces, ostensibly antithetical to those inhabited by civilians in peacetime. The concomitant impression is that civilians can humanize borders by channeling creative energies to subversive effect. Think of the colorful graffiti on the western side of the Berlin Wall, or the works of the elusive artist Banksy, who brought the divided German city’s visual motifs (such as the iconic trompe-l’oeil barrier breech or the make-belief scenic vista) to Gaza in 2005. Consider also the shrines and crosses at the Mexican border, which commemorate the thousands who died in US Border Patrol operations, or the more choreographed incentives that reimagine this emergent border wall, several . . . This April, Emmy Award–winning filmmaker Martin Doblmeier’s documentary about the American theologian Reinhold Niebuhr (1892–1971), An American Conscience: The Reinhold Niebuhr Story, debuts on public television. The film explores the life of Niebuhr, theological liberalism’s best-known promoter (author of the “Serenity Prayer”), and how he positioned himself as a voice of conscience during some of the twentieth-century’s most potent times of racial unrest, depression, and global conflict. Hal Holbrook reads as Niebuhr, and the film includes interviews with Jimmy Carter, Andrew Young, David Brooks, Cornel West, and others. You can read more at the Journey Films website, and in the interim, here’s a list of works by and about Niebuhr, published by the University of Chicago Press. *** The Children of Light and the Children of Darkness: A Vindication of Democracy and a Critique of Its Traditional Defense, first published in 1944, is considered the standard bearer of Niebuhr’s philosophy, which took up the timely question of how democracy as a political system could best be defended. The Irony of American History, cited by politicians as diverse as Hillary Clinton and John McCain, posits the incongruity between personal ideals and political reality as both an indictment of American moral complacency and a warning against . 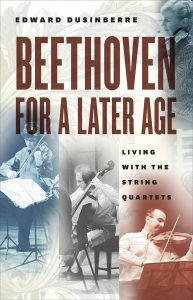 . .
From Richard Fairman’s review of Beethoven for a Later Age at the Financial Times: The book follows personal journey, while simultaneously threading through the parallel stories of Beethoven’s development as a composer, of the string quartet in general, and of early 19th-century culture and politics. Does all that seem a tall order? The narrative is potentially as complex as one of Beethoven’s knotty four-part fugues in the late quartets, but 20 years’ experience of playing chamber music has made Dusinberre adept at handling the interplay of multiple themes. Self-awareness and a sense of humor play their part. Sleight of hand makes the book entertaining and easy to digest. Back in 1993, the invitation to join the august Takács Quartet was not extended lightly. “This is not a job,” warned one of the other three. “It’s your family, your life.” Periods of months away on international concert tours mean that any kind of settled social life has to be forgotten. From day one, the diary involved criss-crossing continents in a dirty white Ford Granada alternating with long hours of rehearsal sessions, day and night in the company of the same three colleagues. Every string quartet sets out with the intrinsically contradictory aim . 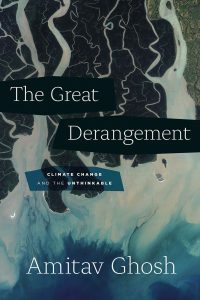 . .
From Lawrence Lenhart’s recent review of The Great Derangement: Climate Change and the Unthinkable, at the Rumpus: The largest section of The Great Derangement examines “Story” (the consignment and suppression of literary forms), but Ghosh also looks at the impact of alternate histories and global politics on climate change discourse. He wags his finger at those who would blame Indian and Chinese modernization for bringing us to the tipping point; instead he points to western idealism and technophilia that created the myth that everyone can have two cars, a washing machine, and refrigerator, when in fact “modernity can only be practiced by a small minority of the world’s population… not because of technical or economic limitations but because the earth would asphyxiate in the process.” What’s more, Ghosh directs our attention to the irony that “the Anthropocene has reversed the temporal order of modernity: those at the margins,” Tuvaluans and southern Bangladeshis for example, “are now the first to experience the future that awaits all of us.” Elsewhere Ghosh takes exception to John Updike’s description of the novel as an “individual moral adventure.” This conception makes us more likely to tell stories about the fall of the Berlin Wall or the . 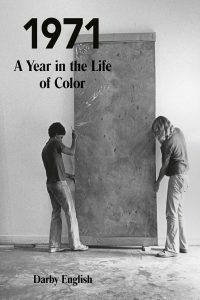 . .
Darby English’s 1971: A Year in the Life of Color points to a moment when the self-representation of black American artists working in the wake of modernism manifested in two shows staged during a tumultuous period of cultural, political, and aesthetic change—Contemporary Black Artists in America, at the Whitney Museum of American Art, and The DeLuxe Show, “a racially integrated abstract art exhibition presented in a renovated movie theater in a Houston ghetto.” *** Hyperallergic (in a piece by Jessica Bell Brown) has more commentary on what the convergence of these two shows meant for dismantling a homogeneous narrative of black modernist expression: Enter 1971, which takes as its starting point a most urgent year in aesthetic and racial politics. English’s object of study are two exhibitions essential to the ongoing relationship between black American artists and modernism: The Deluxe Show and the Contemporary Black Artists in America exhibition at the Whitney Museum, preceding Deluxe in the spring of 1971. In his book, English magnifies “an unprecedented brief swell of dissent within black political culture” that year, centering his study on the status and relevance of “color” as an aesthetic and social obsession. For so long, historians of African American art were unable . 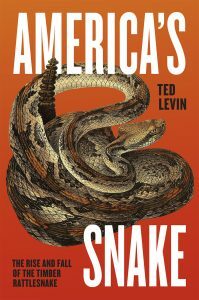 . .
Michael Swingen was assigned to review Ted Levin’s America’s Snake: The Rise and Fall of the Timber Rattlesnake for Rain Taxi Review of Books. What did he do instead? He created the 30-minute short film, “Snakes and Such,” about “the book, the author, and the process of reviewing.” Watch it in full below: To read more about America’s Snake, click here. . . .
Tzvetan Todorov (1939–2017)—literary theorist, intellectual historian, and philosopher—died earlier this week; in particularly uncanny circumstances, our free e-book of the month happens to be his The Fear of Barbarians. Rather than link to an obit, we’re going to reblog a conversation between Todorov and media scholar WJT Mitchell—who had never met in person or previously exchanged correspondence—that unfolded over three days on our blog, back in December 2010, on the heels of the then-recent publications of Barbarians and Mitchell’s Cloning Terror. Little more than six years ago, and the topics they discuss—the politics of occupation, the war on terror, the then-emergent Wikileaks, Goya, the US State Department’s penchant for torture, Guantanamo, cloning—feel both like prescient observations from a time now past, and nearly enraging in their unfortunate contemporaneity. Below, you’ll find links to Parts II and III. Download your free copy of The Fear of Barbarians here. 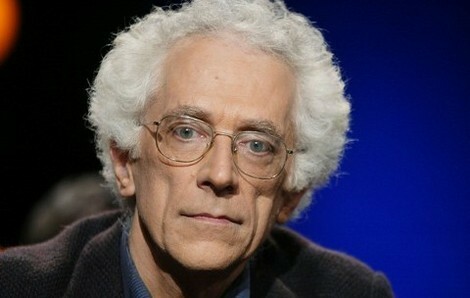 ** We’re kicking things off with a series of letters between Tzvetan Todorov, author of The Fear of Barbarians: Beyond the Clash of Civilizations and W. J. T. Mitchell, author of Cloning Terror: The War of Images, 9/11 to the Present on the visual imagery of the war on terror, our current global political climate, and the role of . . .